"This three-sided LP is a unique collaboration by some extraordinary talents, working under the moniker of the Afternoon Saints, better known individually as Lee Renaldo (Sonic Youth), David Watson, Christian Marclay and Gunter Muller. 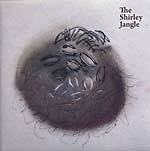 The Shirley Jangle is an intimate and subtle meeting place of noise, sound art and experimental improvisation. Three sides of bubbling audio biosphere and a fourth side etching by Lee Renaldo, made specifically for this release. The album was recorded at the famed Echo Canyon Studio, on Murray Street, in downtown New York, mixed and edited by the one and only Jim O'Rourke." Super deluxe, beautiful gatefold sleeve with full color printed inner sleeves.